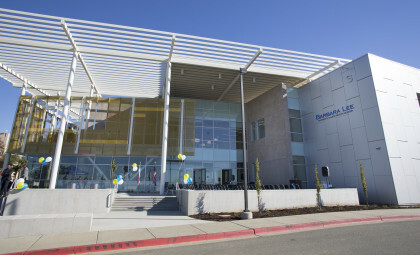 The Barbara Lee Science and Allied Health Center is the newest building at Merritt College in Oakland – one of the four colleges of the Peralta Community College District, which includes Berkeley City College, College of Alameda and Laney College, also in Oakland – and is now one of just two buildings named as “Outstanding Project for 2015” by the prestigious Western Council of Construction Consumers during their annual Excellence Awards ceremony that was held on October 27, 2016 at the Lafayette Hotel and Spa. In announcing Merritt’s award, the Council said that the Barbara Lee Center was “Among the most sophisticated community college learning centers in the U.S., and the most advanced community college science center in California.” The building was also one of the few recipients during the program to receive a “Sustainability Excellence Award” for its LEED Gold Certification. “We are planning future endeavors and I have every reason to believe those will also win recognition,” the Chancellor added. On hand to accept the award for the Science and Allied Health Center was Derek Labrecque, Partner, and Shawn Percey, BIM Manager, from JK Architecture – the firm that designed the Center – along with Ted Foor, Larry Cabodi, Sean Burnie and Anna Kennedy from Clark/Sullivan Construction, the firm responsible for the construction of the Center. Also in attendance at the ceremony, and representing the Peralta District, were Chancellor Jowel Laguerre, Ph.D., and Dr. Saddiq Ikharo Vice Chancellor of Facilities, along with Merritt Dean Rosemary Delia and Gary Banks. With over 110,000 square feet of dedicated space for science and technology, the Barbara Lee Health and Science building is the region’s newest epicenter for innovation in science and technology. As part of the Peralta Community College District’s commitment to provide access to the region’s student population, the building will be open all strata of students – concurrent enrollment high school students to life-long learners. The majority of the four-story building, which was completed on time and within budget, is dedicated to programs in the Sciences and Allied Health, but includes Mathematics and Business Technology as well. The architectural design of the building, and the state-of-the-art equipment, provides something for everyone, enhancing the student learning environment, promoting the growth of the sciences and energizing the campus as a whole. At various locations throughout the building, there are a number of public common areas for students and faculty to freely interact. These common areas have an open environment within the building to encourage active learning in an environment that is not just limited to the classroom.